Sources: *Crummy Media Solutions, Why Use Twitter for Marketing?, April 12, 2013. **6S Marketing, Infographic: Canadian Internet Usage Statistics on Mobile, Search and Social, Chris Breikss, November 21, 2012. Reliable infrastructure is the backbone of a thriving municipality. Reaching the end point can however be fraught with public complaints. Often issues arise because the community doesn’t know when construction is happening, where, why and how they can best work around it. Traditional tactics, such as newspaper ads and Public Information Centres (PICs), can reach those who regularly scan their local paper or fit an extra appointment in their free time. But if you rely solely on these tactics, you may miss many people who spend their weeknights ferrying their kids between events, meeting with work colleagues or catching their breath at home. Most of these busy people likely share one habit: they almost always have a smartphone, tablet or computer nearby. 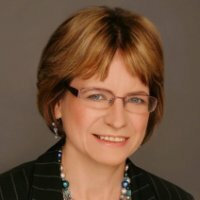 According to research from Canadian’s Internet Business, Canadians spent an average of 26 hours per week on a tablet, smartphone or computer in 2013. In fact, 6S Marketing found that 79% of us don’t leave home without our mobile device. And yes, 63% of Canadians are visiting or interacting with government websites, including their local municipality’s site. Many municipalities have recognized this and are taking their message online, where their audience is, versus relying on them to make a special trip to learn what’s happening. Like traditional tactics, people can learn about your project’s status at one point in time and its long-range plans. But once you’re in the midst of an event or construction project, where accessible roads fluctuate by the day, hour or minute, how can you best keep your community informed? One answer is a micro blogging site like Twitter, which more than four million Canadians use, according to Crummy Media Solutions. It’s a good way for your community to get up to the second updates through multiple devices and avoid traffic jams. It’s also a way to be accountable and transparent with your community. 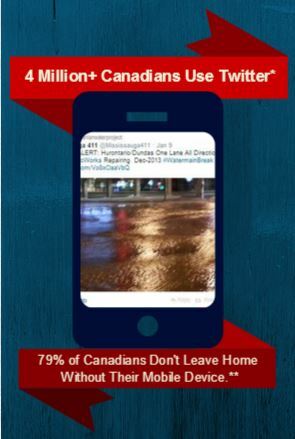 Regina was one of the first Canadian cities to discover the benefit of using Twitter to deliver public works updates. Specifically, Regina began using Twitter in 2009 to address its citizens’ top service requests about snow removal. Namely, what roads were closed or closing, where the ploughs were going and when they’d reach their neighbourhood. Since then, many other municipalities, particularly large ones, have followed suit. We find Twitter particularly useful for major events or infrastructure projects that impact a broad audience and are steadily implemented over a set time period. The Municipality of Peel’s Hanlan Water Project is using Twitter to deliver timely online updates to its diverse stakeholders, via computers, tablets or mobile devices, before they start their daily commute. It also provides updates throughout the day to help transit, transport and other drivers avoid delays. To increase goodwill within its community, the project team has also used this tool to promote some businesses along the route and remind customers that they remain open during construction. In Gauteng, South Africa, Twitter was the leading social media platform used to launch and promote “Gautrain,” its new rail system as the best way to get around the city during the 2010 FIFA World Cup. The strategy was launched with an online gathering of twitter followers (called a ‘tweetup’) and the train itself started with a Gautrain Inaugural Breakfast Run promoted online with conversations using the hashtag #GIBR. Plus, Twitter helped drive support for a blanket collection to keep the city’s homeless warm. We suspect Twitter will play no small role in Toronto’s upcoming Pan Am Games. Since Twitter supports conversations with a crowd, it can also reduce phone calls to your information line by publicly answering questions once or twice that many people might otherwise call about. As such, it can rapidly resolve issues and potentially cultivate advocates. And should an emergency arise, Twitter is likely to more than prove its value, as it did in Calgary’s 2013 summer flood and in many other crises. Unfortunately not all municipal services have Twitter or other social media keyed up and ready, as we discovered in interviewing Park Property Management about how its tenants coped in Toronto’s holiday season ice storm. Watch for upcoming posts, where we will outline some best practices to build your Twitter following, communicate effectively and multiply your municipality’s messages that we integrate in strategies for our clients. This entry was posted in Communications, Communities, Consultation, Management, New Media, Planning, Politics, Transportation and tagged infrastructure, municipalities, social media, twitter. Bookmark the permalink.